Solar Thermal panels are used mainly for heating hot water, but can also be used for generating energy for space heating. 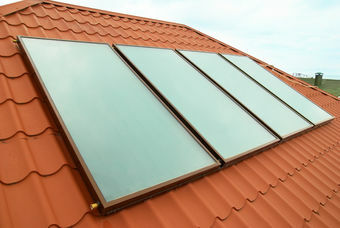 Panels are connected to a solar cylinder that can store water for distribution to the plumbing or heating system. During the summer months you could expect to heat 100% of your hot water requirements from your solar panels. In winter with fewer daylight hours this would be reduced to around 30%. To supplement your hot water requirements during these periods, heat pump systems or conventional boilers or immersion heaters can be used.